Book 1 of "Gentlemen Bastards"
SYNOPSIS - An orphan's life is harsh - and often short - in the mysterious island city of Camorr. But young Locke Lamora dodges death and slavery, becoming a thief under the tutelage of a gifted con artist. As leader of the band of light-fingered brothers known as the Gentlemen Bastards, Locke is soon infamous, fooling even the underworld's most feared ruler. But in the shadows lurks someone still more ambitious and deadly. EXCERPT - The Red Hands led Locke up the long gangway to the Floating Grave just as the scarlet sun broke above the dark buildings of the Ashfall. The whole Wooden Waste turned to blood in that light, and when Locke blinked to clear the brightness from his eyes, even the darkness flashed with red. Locke struggled to keep his head clear; the combination of nervous excitement and fatigue always made him feel as though he was sliding along an inch or two above the ground, his feet not quite reaching all the way down. There were sentries on the Quay, sentries at the door, sentries in the foyer - more than there had been before. They were all grim-faced ans silent as the Red Hands led Locke deeper into the Capa's floating fortress. 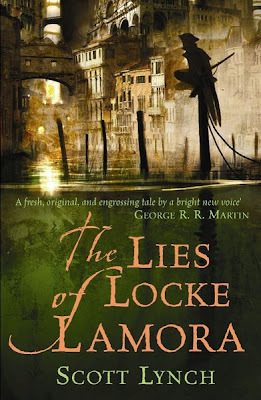 FL Speak - Meet master thief Locke Lamora. An orphan, brought up on the streets of Camorr, he's the infamous Thorn of Camorr. Together with his team, The Gentlemen Bastards, Locke and his crew dare to oppose the pact. The pact that the rich nobles made with the Underworld's Don, that they will never be harassed. Locke and his crew does exactly that. They steal from the rich and no, do not spend it on the poor. Half Robin Hood, half Ocean's Eleven....this is a first class work of originality and fantasy. But the life of a thief is risky and short. Specially when a very powerful mage has his eyes on the young Locke. And no matter how much you steal and where you hide, you're never really safe. But everything becomes personal when the attack is on his crew mates and Locke and his friends are thrust into a political war of betrayal and secrecy. Locke's life as the Thorn of Camorr while maintaining the facade with the Underworld ruler of Camorr goes for a toss, when the Grey King, an assassin, forces Locke into a private grudge between the two. Locke will need to be his best and match wits with the Gray King to come out alive and maybe, save the city as well. Brilliant writing. Fast paced, hilarious and thoroughly entertaining, Scott Lynch releases a scorcher of a debut. Nowhere did I feel the urge to skip through pages. The antics of Locke as a child are brilliant and I laughed at his mess and marveled at his ingenuity. Locke grows up to be the leader of the gang and his wits and loyalty keeps the band together. Together the worship the god of thievery (which amused me immensely). 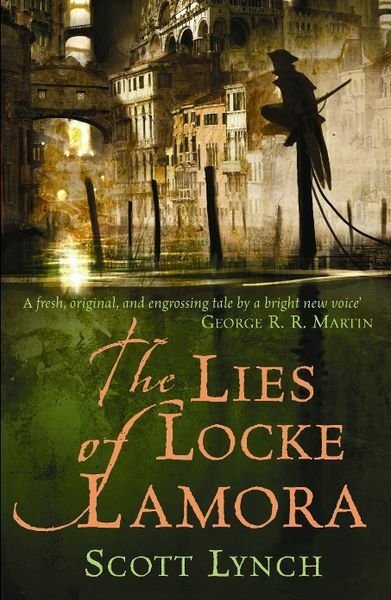 Locke Lamora is described by his previous master as the guy who steals too much. Now that made me laugh out loud. He's brilliant. Locke Lamora is absolutely epic! If you want to read a fantasy that is not an epic fantasy, this is the book for you. If you want anything else, then THIS IS THE BOOK FOR YOU. Brilliant review! not into fantasy but storyline is very interesting i will start with this one..
pardon my ignorance: what is a mage? 'Mage' is one of the many terms for a wizard or sorcerer or simply magician.